Beginning in 1982, Mac's Black has had an esteemed history, being the only dark beer available in New Zealand for a number of years. Once competition emerged, Mac's Black was refined with a new hop combination and five-malt grist cementing its place amongst top New Zealand dark beers. 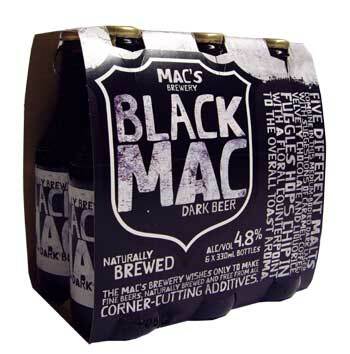 Mac's Black is a flavoursome medium-bodied dark beer with a rich, velvet texture. It delivers hints of caramel, nuttiness, licorice and a measure of soft chocolate, balanced by clean bitterness. The aroma is floral, with sensations of spice enhancing the malt characteristics to create a truly decadent, complex taste experience.